For more than 10 years, all Android users have dreamed of having a full true subscription in the Google Play Store, which allows you to get notifications that a particular program is now available for purchase at a discount. Now, there is such a feature, and everyone can use it for free. It is enough to subscribe to the pages of updating any applications, if suddenly they become cheaper, for example, within the framework of a sale or promotion, they will immediately receive a notification of this by e-mail. However, as developers promise, such an opportunity will appear in the near future, but now you can only subscribe to a message about the emergence of new games and applications, which previously was impossible to do. Most likely, notice of discounts will appear in the next two months. In addition, now in the Google Play right in the main menu “Games” there are subcategories “Novelty” and “Premium”. First, all new video games that were released last month, and the second developer can add their software for money, which may be beneficial for large projects. 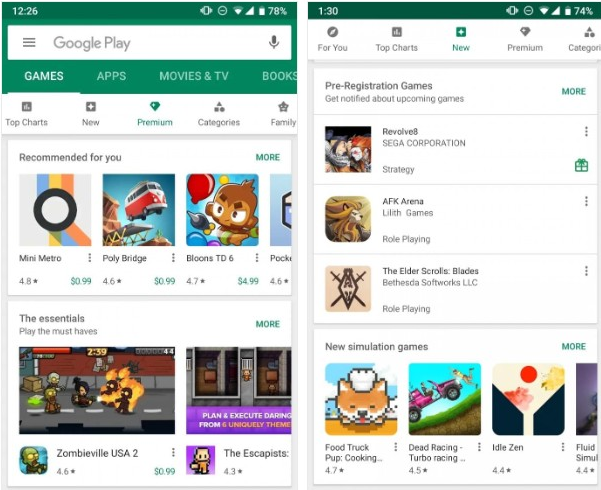 At the moment, the new Google Play collection is available to a limited number of Android-based smartphone users, but in the coming days it should be available to all, including Russian residents. From official sources, it is known that in the coming months, the playmaker must receive subscription support called Play Pass, which will allow for a fixed amount of money to have monthly access to all of the apps and games available in the app store. Such an innovation is likely to be available for the first time in the United States only, and then people from other regions of the world will have access to it.